Frank and April meet at a party, share a look and a laugh, exchange pleasantries. She's a dreamer, and he wouldn't know how to dream even if one came for him. One would assume they see something in one another, and whatever it is, they are off to the races. Cut ahead several years, and they have a house, two kids, and no idea why the hell they are together. Sam Mendes' Revolutionary Road is a wonderful downer of a movie, a holiday picture for all of us who don't want to go home for the holidays and pretend everything is okay. Based on a novel by Richard Yates, with a script by Justin Haythe (The Clearing), this 1950s melodrama is heavy on the drama, but only its overall pacing is mellow. Frank and April pick up emotional chairs and batter each other with them repeatedly, with very little pause to stop and pretend to say "I love you." If they stick it out, they will be ready to reprise Who's Afraid of Virginia Woolf? in a sequel, when the drinking gets heavier and the bitter comedy more prevalent. Much is going to be made of the fact that this movie reunites Titanic co-stars Leonardo DiCaprio and Kate Winslet. Here they inhabit some parallel universe where Jack didn't have the good graces to drift away and die, and he and Rose ended up living the miserable dream of many a desperate American. Frank is a veteran, but he also ended up working in the same company where his father slaved away as a salesman, a cruel irony that has not been lost on the son. Having just celebrated the big three-oh, Frank has become everything he had hoped never to be simply because he never came up with an alternative choice. Likewise, he has dragged April there with him. A wannabe actress withering away in productions staged at the High School gym, Frank was her alternative, and she's finally realized she picked wrong. 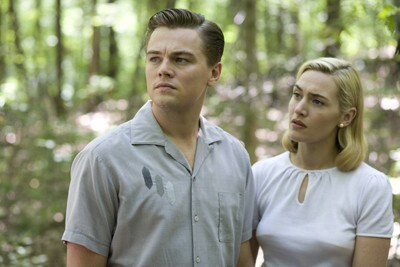 The most surprising thing about Revolutionary Road is how lacking in sentimentality it all is. Mendes spends no time building a romantic past that he can then dismantle. Instead, he gives us only three memories scattered over the first half hour or so: the day the couple met, the day they found their house on Revolutionary Road, and the one time Frank told April he liked Paris when he ended up there during the war. In some ways, Mendes wouldn't need to show us the romance if he had any desire to, our collective memories of stories just like this allows us to fill in those blanks. What sets Revolutionary Road apart from the pack is Mendes is adamant that there never was a passionate love affair between these two. They married for no good reason, and they are merely hanging around until one of them has the guts to admit the truth. Which April does, but only after she has tried to manufacture the romantic dream they never had. The marriage begins to go pear-shaped when she seizes upon a plan to have Frank quit his job so they can pack up their kids and move to France. There, April will work to support Frank so that he may while away the hours in his favorite city and at long last figure out what he wants from life. It's a little like taking a man who has been blind from birth and pushing his face into a floodlight, demanding that he see the brightness that has so long eluded him. On board at first, Frank's resolve unravels amidst unexpected promotions, infidelity, and other surprises neither participant sees coming. Mendes, whose previous credits includes American Beauty, another classic of a failing marriage, casts Revolutionary Road in a grim pallor. In his eyes, 1955 is all soft, neutral colors--icy limes, weak blues, and noncommittal beige. The constant presence of cigarettes and martinis, as well as Frank's copy writing job and the disparity between office and home, city and suburbs, will remind some of Mad Men, but Mendes avoids the flash the television series so revels in. Mad Men sometimes winks so hard in reminding us that these fellows are building the world of tomorrow, it bruises its cheek. Mendes and the writers put Frank on the brink of tomorrow but realize that neither it nor the more important today are an alien place. Revolutionary Road is way more human, and thus more brittle. Both DiCaprio and Winslet are amazing. We all know how wonderful Kate Winslet can be, and I feel like there should be some added props given for the fact that she is married to Sam Mendes, and for a husband to direct his wife through such an emotional minefield speaks of a commitment to craft on both of their parts. DiCaprio gives a fierce and fragile performance that should finally push anyone still clinging to some teenybopper doubts to let them go. He's one of our most undervalued actors, and his work in this movie is more masculine in its rampant anger and sadness than any of the tough guy parts he's played for Martin Scorsese or Ridley Scott. Also of note is the performance of Michael Shannon, probably best known for playing the heavy in movies like Before the Devil Knows You're Dead. Shannon plays John, the mentally disturbed son of a neighbor couple who have befriended Frank and April. (His mom sold them their house, and she is played by Kathy Bates, also a Titanic alum.) It's a difficult part, and it would have been easy for the actor to slip into the grotesque. In his two scenes, he represents the counterpoint to the life of conformity that threatens to swallow Frank and April. He's the only one who understands what they are seeking from their Paris trip, who sees what Frank calls the "emptiness and hopelessness" of their lives. He's also not afraid to say what is on his mind, knowing that since he is considered crazy, he will mostly be ignored anyway. Yet, in an insane world, the crazy man is the only one who sees the truth. The true star, though, is the writing. I have not read the source material, so I don't know how much credit to give to Richard Yates and how much to give to Justin Haythe, but however it breaks down, the joint effort between them is extraordinary. The dialogue in Revolutionary Road manages to have style without being pretentious, and in each scene, in every successive argument between these young marrieds, the script finds the dirty emotional center without using manipulative tricks or forcing the material to go there. It's as honest a portrayal of the bleak landscape of a failed union as you are ever likely to see. Mendes smartly refrains from piling on any extraneous style, instead hanging back and letting the actors work the words and the words work them. When Revolutionary Road was over, I joked, "Boy, I love a Christmas movie." It's a gag I carried over into the intro of this piece, even though the only thing the movie has that connects it with Christmas is its release date (the drama is set in the summer); nevertheless, given the treacle that has become a staple of the Christmas season, I actually do think that there are many among us who will find some comfort in a film that doesn't push us to pretend that life is nothing but sweetness and light. After all, just because you got coal in your stocking doesn't mean you can't use it to start a fire. Am I right? Jamie S. Rich is a novelist and comic book writer. He is best known for his collaborations with Joelle Jones, including the hardboiled crime comic book You Have Killed Me, the challenging romance 12 Reasons Why I Love Her, and the 2007 prose novel Have You Seen the Horizon Lately?, for which Jones did the cover. All three were published by Oni Press. His most recent projects include the futuristic romance A Boy and a Girl with Natalie Nourigat; Archer Coe and the Thousand Natural Shocks, a loopy crime tale drawn by Dan Christensen; and the horror miniseries Madame Frankenstein, a collaboration with Megan Levens. Follow Rich's blog at Confessions123.com. Buy tickets to "Revolutionary Road" now!